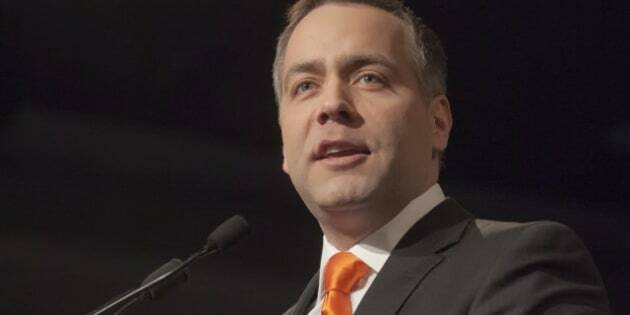 SASKATOON - Saskatchewan's new NDP leader,Cam Broten, says it's time "for all hands on deck" as the party looks to rebuild after being massacred in the last provincial election. In his first official speech as leader, Broten told party members Sunday that they must be united. "It's a time for all of us regardless of what team we supported to come together under one orange banner and build the alternative and earn the trust of Saskatchewan people once again," Broten told about 445 people at the party's convention in Saskatoon. "This is my invitation to you, if you wore a button, if you volunteered to work on a campaign...if you came out to a debate, if you simply cast your vote yesterday, I want you to be part of the new NDP here in Saskatchewan." The appeal came after Broten defeated Ryan Meili by just 44 votes on Saturday to win the leadership. Broten captured 4,164 of 8,284 votes cast on the second ballot while Meili received 4,120 votes. Regina MLA Trent Wotherspoon got dropped off after the first ballot. Before starting his speech, Broten named Wotherspoon as the new deputy leader. Broten also invited Meili to speak. Some of Meili's supporters were in tears after the loss on Saturday and many questions were asked about how the party will retain the young people that were attracted to his campaign. Meili said Broten has his full support. "We all need to be one team now and build on the work that was done," said Meili. And the NDP has a lot of work to do. The party that Tommy Douglas founded and was led by political giants like Allan Blakeney and Roy Romanow is down to just nine of the 58 seats in the Saskatchewan legislature. It desperately needs to find a way to reconnect with voters and many think a younger, more energetic leader is the key. "I want to listen," Broten told reporters after the speech. "I want to have people taking on significant, important roles within the party because we need all hands on deck. This isn't the time to push people away. It's a time to welcome in even more people." At 34, Broten is the youngest person to lead the Saskatchewan NDP. The married father of two young daughters, was first elected as a member of the legislature in 2007 and re-elected in 2011. New Democrat Crystal Halliday, 28, said Broten should attract other young people to the party. "When you're young and you get drawn in and you get drawn in by more young people, you feel a lot of energy, you feel a lot of change, you feel a lot of kinsmanship," Halliday said Sunday. Seventy-two-year-old Jessie Carlson, a life-long supporter of the NDP and its predecessor, the CCF, said it's important to let younger people step up. Carlson said she thinks there was a younger crowd overall at this gathering compared to past conventions. "I think it was and that's what it should be," Carlson said Sunday. "I think there's a changing of the guard. I think that shows in the leadership candidates. We had no older leadership candidates. I mean Ryan was the oldest and he was the one that was representing, I think, a stronger contingent of young people than anyone else." There was a suggestion from the Saskatchewan Party that Broten was still part of the old guard in the NDP _ which Broten laughingly dismissed. "Well, if 34 is the new old guard, that's news to me. I know I have some gray hair, but I'm not the old guard," said Broten. "What we saw today at this convention is a youthful convention, an energetic convention. The campaign teams were filled with young people and that's a great thing for the party and I'm committed to listening and working with New Democrats whether they're young or young at heart." Broten's first test as NDP leader will come Monday, when he takes over as leader of the Official Opposition in the legislature.